------ Chadwick High School ------ "Silver Streaks"
Chadwick (population 505) is located in northwestern Illinois in Carroll County.The town sits quietly along Il. Rt. 40 approximately 24 miles northwest of Sterling. The first school building built in Chadwick occured in 1859. In 1885, a four-room high school was built with the first graduates were Charles and Grace Stevens and Clayton Colcard in 1896. The present building was built in 1915. 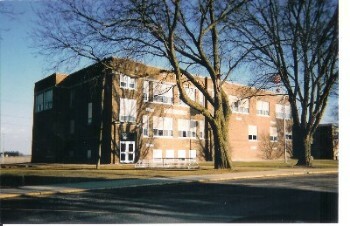 Janet (Miller) Wiersema (CHS Class of 1986) tells us it was in 1989 that Chadwick High School was closed. 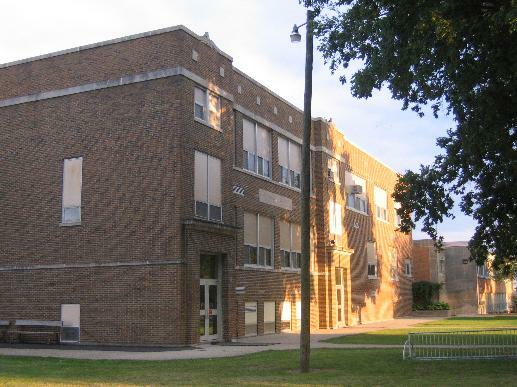 The Chadwick School District consolidated with nearby Milledgeville High School. 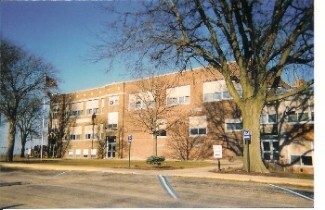 The high school building in Chadwick is now used as a middle school. More information is being sought regarding Chadwick and its school system. 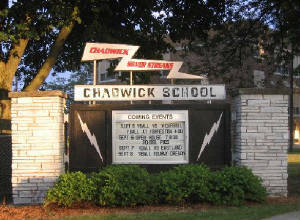 School nickname: the "Silver Streaks"
School Fight Song: "We're Loyal to You Chadwick High"
The boy's from Chadwick High School have a very long and storied history on the basketball court. CHS won a total of 9 District Championships, 3 Regional Championships, and 1 Sectional Championship (which also gave them their only Sweet Sixteen appearance). Not bad for such a small community. Chadwick may have participated in the Northwest Upstate Illini Conference in it's later years. We are seeking the season records and coach's names from the better teams in Chadwick High School history. The titles found on the IHSA web site (www.ihsa.org) are listed below. ***On February 28, 1962 in an IHSA District Tournament game against Lyndon, Chadwick won by the score of 133-36, a 97-point margin of victory! In the first quarter alone, the Streaks scored 44 points. "Twin towers Jeff Hippen and Mike Ottens, a pair of 6-5 standouts, lead tiny Chadwick. The Silver Streaks boast an enrollment of 87 students, smallest in the field. Hippen, a senior, and Ottens, a junior, lead an attack that does quite well from the inside. Hippen's brother, Jack, helped the Streaks to the sectional finals last year. Jack is currently playing at Wisconsin. Coach Jack Fritz, in his sixth year, has never had a Chadwick team win fewer than 17 games. The Silver Streaks, champions of the Upstate Illini Conference, lost their fifth game of the year to Savana and have been on a roll ever since." During the 1982 season, coach Fritz was in his 6th year at Chadwick with a record of 131-30. They lost in the 1982 Rock Island Super-Sectional to Monmouth 86-61 and finished the year 28-2. In that Super-Sectional game, Hippens scored 24 points and had 7 rebounds, while Ottens put in 16 with 9 boards. In the final AP regular season poll, Chadwick was ranked #13 in Class A. 1987-88 N.R.A. Regional Champions Coach Bob Prusator, Jr.
One of the best baseball players to take the mound for the Streaks was Bruce Scheidegger. In 1976, Scheidegger won 17 games and threw for 133.1 innings for the Streaks. He coached at Tonica, Prophetstown, Dixon and Sterling and is now Athletics Director and Girls Basketball coach at Sterling. Not to be outdone, the Lady Streaks of Chadwick High School brought home some IHSA hardware of their own winning Regional Titles in Softball and Volleyball. Their successes are listed below.